Because apples/autumn/upstate: We finally got a chance to try a Snapdragon apple, one of the new varieties publicly announced last year after being developed at Cornell. We picked a few of them up at the Samascott farm store in Kinderhook. So, how do they taste? The texture is crunchy, and the flavor has an interesting sweetness. They've been described as having a "spicy-sweet" flavor -- and while we're not sure we'd describe it that way, it's more complex than a flat, uniform sweetness. We enjoyed the apples. Snapdragons are still a year away from being widely available, according to the New York Apple Association. But a handful of orchards in the greater Capital Region are growing them, including Indian Ladder, Goold, Golden Harvest, Samascott, and Bowman. The Snapdragon was introduced with the RubyFrost, and they represent a new effort by Cornell to partner with the New York Apple Growers org to license the apple varieties in North America. 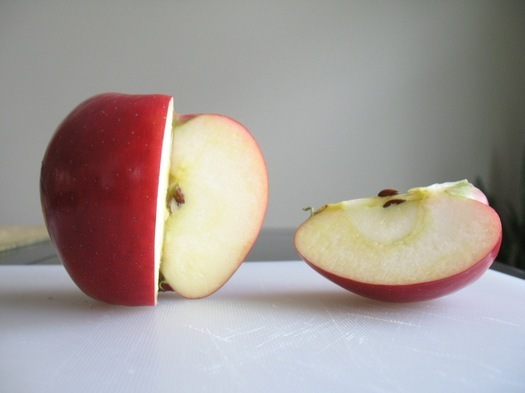 It fits into a wider trend within the industry to establish individual apple variety brands. And, sure, that makes business sense. But we have to admit we're not fans of the names and slogans produced by this trend, like "CRUNCH INTO ZESTAR!"â„¢. They don't have the romance/mystery/history of names such as Esopus Spitzenburg, Worcester Pearman, or Cortland. + How 'bout them (new) apples? The Honeycrisp, locally grown and not allowed to get too big, is the ultimate apple. How dare you assert otherwise! I'm just going to sit here and eat popcorn while the pro-Honeycrisp crowd rallies. The Honeycrisp is my absolute favorite right now too! Couldn't agree more: honeycrisp is the best apple ever! It used to be hard to find in PYO orchards, as they kept it for retail sales, I suppose, but this year Indian Ladder had them as PYO (although I must say that they were not as "clean" as they should be, with a lot of rotted or infected fruit, which is probably why they opened the honeycrisp orchard to the public). That being said, most NY apples are extremely delicious, including the very traditional golden delicious. They are tastier than anything you can buy in the supermaket from other places. Haven't tried a Snapdragon but I'm not too fond of Honeycrisps. A little too sweet like a Delicious. Cortlands rule! I am so happy to read that others don't like honeycrisps! All they have going for them is the crunchy texture, beyond that they are dull. Anytime I mention that to anyone, it is though I have blasphemed. Give me a more flavorful, and interestingly named, apple any day! Honeycrisp shmoneycrisp! Truly the best apple ever is the Northern Spy. Hard to find but if you do you'll be rewarded with the crispest tart-yet-sweet apple around. While we're on the topic of the ever-elusive Northern Spy, does anyone have a good source for them out here? They're my preferred baking apple - the best apple pie in the world is a Northern Spy pie, imho - and I've had very limited success in acquiring them locally. I will enter the honeycrisp fray. I am planning on putting in a couple honeycrisp trees next year. I don't really care too much for eating apples plain (take my Upstate American passport away immediately) but I do love all the other applications of the apple. Mostly hard cider and baking. The honeycrisp is overhyped and overpriced but many seem to enjoy eating it. The honeycrisp's attributes also make it a very good cider and baking apple. I think it is a rather well rounded apple. People will enjoy eating it off the tree and you also have an apple that will shine in the other applications where I think the apple truly sings. @CrankySarah: my only source of Northern Spy apples is from the trees my dad has (up near Lake Ontario). His yield is sporadic at best (maybe very other year) which speaks to why most orchards don't grow them. I'd be curious to find out where they are too. Northern Spy apples are notoriously late in the season, and I've found them at Indian Ladder and Bowmans. And yes, they are the apple pies of my youth. My choice now for pies is Mutsu. I was at Bowman Orchard today, and they had a few bags of Northern Spy left. They also had Fortunes, which are similar to Northern Spy. My Syracuse-raised husband says the Fortunes lack just a bit of the "awesomeness" of the Northern Spy, but are an acceptable substitute.